Anyway, there on the list: Mano Negra at the Town and Country Club, in 1989. I say “almost” as I don’t think I was there then; memory tells me I saw them there in 1990 or 1991, so maybe that’s because they were quite good in 1989, and got invited back or something. So perhaps it doesn’t count. Anyway: they were very good on that occasion, and great fun. If I were to make a list of the 25 best concerts that I’ve been to, that one would certainly make the cut, though it would end up being quite a lot lower down than, say, Anne Evans singing Isolde at Covent Garden around 1993. That was really good. Splendid, even. I’m sure that settles it. I don’t think Googling will help here, but perhaps some of you have better Googling skills than I. Author christopherbrookePosted on January 20, 2007 Categories booksLeave a comment on Who Wrote This? Ethel Bentham, doctor, suffragist, Fabian, member of the Labour Party’s NEC, magistrate and MP for East Islington from 1929 until her death. Born in the City of London, 5 January 1861 died in Chelsea, 19 January 1931. By special request, here’s a picture of Babar the Elephant (and Celeste). 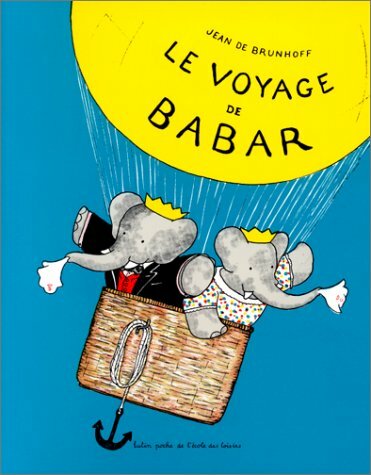 They have a poster up in Blackwells café right now for “Babar et les ballons”, but the mood at the Stoa is that Babar looks best in a balloon when he’s waving his handkerchief from the balloon, as above. Following Richard’s recommendation in comments below, I got myself a copy of Thomas E. Ricks’s Fiasco, and am now halfway through. It’s alright, though it’s a bit heavy-handed, and I still prefer the reporter George Packer’s book (The Assassins’ Gate) to the stay-at-home-and-swap-emails-with-the-troops approach of Ricks. That reliance on slides rather than formal written orders seemed to some military professionals to capture the essence of Rumsfeld’s amateurish approach to war planning. “Here may be the clearest manifestation of OSD’s contempt for the accumulated wisdom of the military profession and of the assumption among forward thinkers that technology – above all information technology – has rendered obsolete the conventions traditionally governing the preparation and conduct of war,” commented retired Army Col. Andrew Bacevich, a former commander of an armored cavalry regiment. “To imagine that PowerPoint slides can substitute for such means is really the height of recklessness.” It was like telling an automobile mechanic to use a manufacturer’s glossy sales brochure to figure out how to repair an engine. David Robb (“Davy”) Campbell, Belfast protestant trade unionist and Home Ruler, leading figure in the Irish Trade Union Congress and Labour Party, later leader of the Labour group on the Belfast Corporation in 1920, shortly before the collapse of socialist politics in Ulster; born in Belfast, 1874/5, died, also in Belfast, 14 January 1934. Georgy Maximilianovich Malenkov, Soviet politician: briefly the successor to Stalin, later the manager of a hydroelectric plant in Kazakhstan; born 8 January 1902, died 14 January 1988. I’ve spent a small chunk of the morning setting up my first wormery. It’s only a small wormery (one of these), but it’s moderately exciting, nonetheless. And if anyone’s got any wormery do’s and don’ts, do share.